The other day just out of sheer curiosity I was going through the cost of designer belts from Gucci. Guess what, the cheapest ones that I saw started from well above $200 a piece. Needless to say that I, with my sense of fashion, which is equal that of a goat, could not understand how it can be justified. I do however understand that it can add a lot of goodwill to your financial status if you were to wear it, but how exactly do you show off that your belt is a “Gucci” without trying to show off, is beyond me. That being said, let me now move on to the topic that I want to talk about in this article which is the use or lack of use of a weightlifting belt when lifting weights. Having trained in my own home gym for about 4 years now, I rejoined a public gym about a couple of months back with my training partner Samrat. The need to join a public gym was simply to get back to some heavy deadlifting and squats which I was unable to do in my own home gym. After a gap of 4 years I observed very few changes in my old gym. People were still obsessed with biceps and chest, they still avoid heavy back squats like the plague, spotters still do a majority of the lifting during an exercise, and sadly the use of weightlifting belts seems to have increased. Yes, whether it be for squats, deadlifts, barbell curls, bench press, or even exercises like calf raises and wrist curls I see more and more people wearing a weightlifting belt all the time. It seems to me that these trainees see absolutely no difference between a regular belt which is worn all day long and a weight training belt which is a lifting aid. Yes, some of the trainees actually do not even begin a warm up until their lifting belt is on, and it does not come off till the last rep is complete. The common reason for such frequent use of the belt is that if one lifts weights without a belt then they will hurt their back and that the belt protects their lower back. How far is this true, and should you really wear a lifting belt? These are some of the questions that I will answer in this post. To begin with I will have to admit that I do not know exactly when was the weightlifting belt invented. I do however know that a lot of the old time strongmen lifted some really heavy weights even before lifting belts were invented. One good example would be the great Arthur Saxon, who lifted 370 pounds overhead in the bent press without the use of modern day belts and surely did not break his back due to it. Many more such strongmen are also seen in pictures lifting heavy weights without a belt and they definitely had healthy and strong bodies. So clearly the belt does have some benefits to offer to the lifter in terms of lifting more weight, and with greater safety. 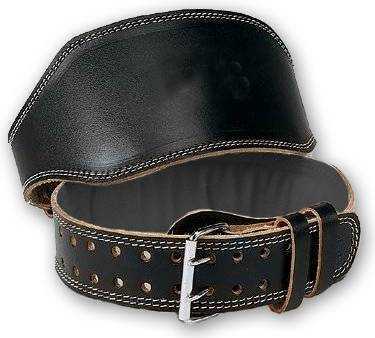 One important thing that must be kept in mind though is that for the belt to be effective it is essential that you wear it tightly. Many novice lifters wear a belt too loose, which honestly makes it worthless. The belt must be worn tightly enough for the lifter to feel it pushing in the insides of the abdomen. Yes, that is not the most pleasant feeling, but is necessary to gain the benefits of wearing a lifting belt. So then the ultimate question remains that should you wear a belt when lifting weights? My personal suggestion is that unless you are competing in a powerlifting/Olympic lifting/strongman event, you should train belt free for atleast 90% of your training life. Yes, if you are looking to break the state/national/world record in a competition then the belt is an essential tool that you must use during competition time, or else you will not hit your max potential. For the rest like myself I prefer to stick to training without any aid and work on strengthening my entire body. Of course if you have any lower back issues, then you would do well to consult with your doctor as to whether a belt is essential for you or not. Remember that whether you use a belt or not, the golden principle for safety remains that you must keep your back neutral while lifting to protect it. So in my final conclusion I would once again heavily emphasize that you must learn to train natural and raw to build max strength and gain the most out of your training, and once in a while you may use a belt, but keep it to as rare as possible to be the strongest that you can. How about this for some heavy lifting minus the belt?